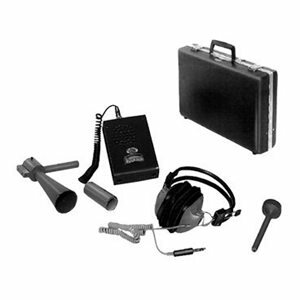 The Ultrasonic Leak and Corona Detector is a low-cost, portable system that receives air-borne ultrasonic signals, converts them to the audible range, amplifies them and displays the output visibly on a meter and audibly through a speaker or headset. The system is designed for locating gas leaks and electrical corona sources, all of which emit strong ultrasonic signals that are inaudible to the unaided human ear. Variously shaped collectors facilitate quick location of ultrasonic sources; in particular, the new directional pickup horn allows pinpointing of discharges in high-voltage equipment while the operator remains at a safe distance. The ultrasonic detection system shown above consists of the instrument with indicator and speaker, plug-in ultrasonic transducer probe, directional pickup horn attachment, sound concentrator attachment and a headset. A carrying case is included.